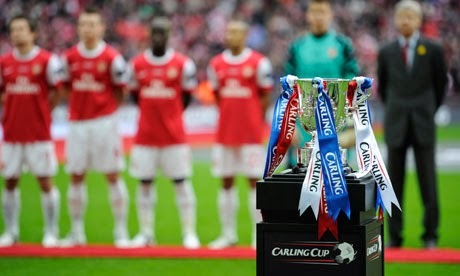 You'd think it would be painful having to watch our rivals play midweek, Coca-Cola Cup Capital One Cup football while our boys sit at home playing FIFA15. It shouldn't be, and here at Gooner.com we strive to take the pain away on an average Wednesday in October. What if we asked ourselves what could have been today, October 29th, 2014 for Arsenal Football Club? What if Akpom would have come on in the 85th minute against Southampton and equalized, only to score the winner in the penalty shoot out 30 minutes later? What if Arsenal went on to play Stoke at the Britannia Stadium instead of Southampton? "It is something we look towards to make adjustments. Welbeck has been training very well this week and we look forward to him having a good game." "Yes, he is very quick and has great ability to hold the ball. We look forward to his quickness and holding ability to help us adjust to the game." After several questions to which it seemed the boss did not understand, the press conference ended. Game time came, and the starting lineup was slightly surprising, with the back four consisting of Kieran Gibbs' right leg, Nacho Monreal, Yaya Sanogo and Michael Thomas. Arsenal started brightly when Khedira Flamini cut open the stoke defense with a perfect through-ball to Welbeck, who did brilliantly until the final ball when instead of calmly slotting it underneath the keeper, decided to somersault several times, landing perfectly on Robert Huth's head only to watch the ball trickle across the touchline. Stoke City's only chance of the first half came when Peter Crouch dressed up like a praying mantis and bit Monreal's head clean off, before deftly placing a shot that hit the cross bar, just out of Ospina's reach. Protests from the Arsenal players to referee Phil Dowd proved useless as the official seemed to be distracted with eating his own hand. It was Arsenal super-sub, Abou Diaby that proved to be the diamond in this Britannia Stadium rough, as he carved up the Stoke midfield time after time in the second half. It didn't start well for the Arsenal midfielder, when after coming on for Gibb's right leg in the 74th minute, both the Frenchman's ankles seemed to snap. This wouldn't deter the 6' 3" midfielder, however, and he plowed his way through reckless challenges to put himself on the score sheet nine times in 16 minutes. Stoke managed to get a consolation goal after the entire Arsenal team left the field early in stoppage time when they discovered Podolski had started Karaoke early and was singing 'In Your Eyes' to Pat Rice in the dressing room - something the Arsenal manager would later describe as a "lack of commitment" from his players. Stoke City 1 - 9 Arsenal was the final score and Arsenal had earned themselves a place in the quarter finals of the League Cup.